Warning: The follow actions will delete both all data and applications on the device. Back up the data previous to wipe your device. You have the choice of erase all the data and applications on your BlackBerry device. 1. Select the Wipe Handheld option. 2. Type an incorrect password ten times. 3. Use Application Loader to erase all data. 4. Use Backup and Restore to clear the device databases. To erase all the data on your BlackBerry device, this option is available with BlackBerry Device Software 3.8 and later. Click Security Options > General Security. 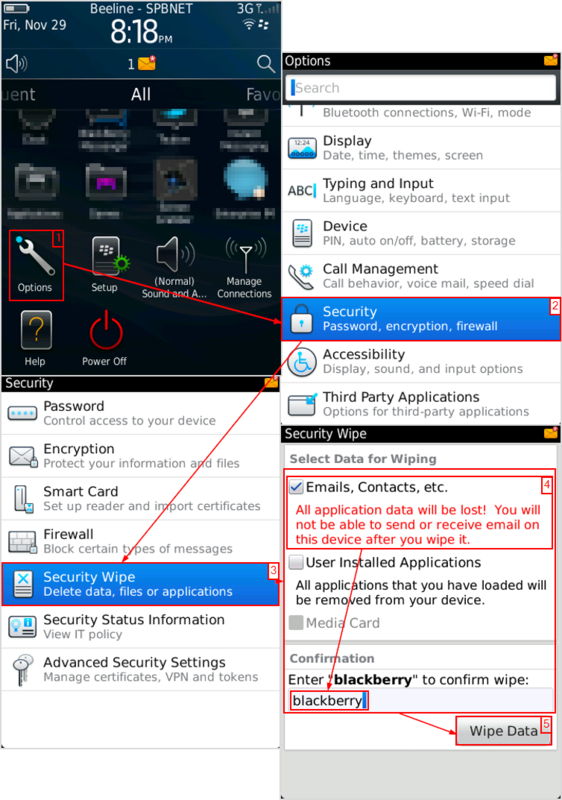 Select data to delete and type “Blackberry” to confirm wiping of the device. Tap Wipe Specified data on the BlackBerry device will be erased. Some new versions of BlackBerry software, the menu navigation is different. To erase all the data on your BlackBerry device, type an incorrect password ten times. You may be pressed to type blackberry an only some times during the method after finished, all data on the device is erased.